Check out these simple tips to help a senior avoid the blues this holiday season. Ah, the holidays: they’re sometimes the most wonderful period of the year, or perhaps the most challenging. 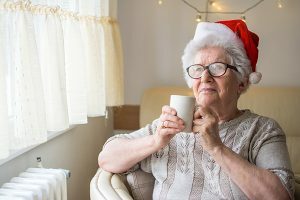 For some older adults who have lost family members, are struggling with chronic medical conditions, or are experiencing isolation and loneliness, the holiday season can lead to depression. And, the family caregivers who care for a loved one can also be vulnerable to holiday blues, because of the overabundance of stress. Seek medical assistance. It’s crucial to communicate any suspected signs and symptoms of depression (modifications to sleeping and eating habits, lack of desire for previously enjoyed hobbies and socializing, sluggishness and constant despair) to your senior loved one’s (or your) primary care physician. There are effective treatment options readily available, plus it’s important to eliminate any other medical issues. Make healthy choices. With many high-fat, high-sugar, high-salt foods accessible during the holidays, it’s very easy to let a balanced and healthy diet slip and overindulge. Yet eating unhealthy, combined with drinking too much alcohol, can add to feelings of depression. It’s also important to obtain a lot of sleep; 8 hours is optimal for most adults. Start new traditions. Frequently for aging parents, holiday traditions have had to evolve over time. Starting a new normal isn’t always easy, but may lead to revitalized interest in holiday activities. Try participating in an evening of caroling, a shopping and lunch excursion at a brand new place, going to your local high school’s holiday play or performance, etc. Reminisce. Rather than steering clear of emotional conversations about lost family members or past holidays, encourage the senior to talk about memories, and take enough time to listen and be involved in the conversation. Looking through pictures or watching home movies might help the individual process the loss and begin to move ahead toward acceptance and comfort. Help others. Nothing improves our state of mind quite like knowing we’ve helped someone else. Search out opportunities for your elderly loved one to volunteer in some capacity to help those who are in need: baking treats for a local homeless shelter, picking up small toys and gifts to deliver to the children’s hospital, assembling care packages for those in the military, etc. For further suggestions to encourage your elderly loved one to stay active and engaged during the holidays and all year long, contact Midnight Sun Home Care’s team of Alaska home care professionals. Our fully trained caregivers are experienced in assisting older adults to live life to the fullest, and we’re here for you with as much or as little help and support as needed. Contact us online or call us at (907) 677-7890 for additional information about our Alaska home care services. To learn more about the different areas we serve in Alaska, visit our Service area page.